Design Sponge gave us a tutorial on how to make these lights back in 2008. 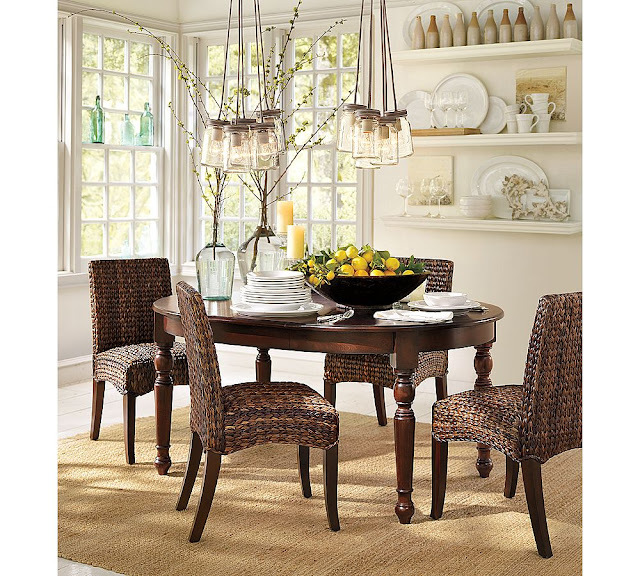 Pottery Barn currently sells their Exeter Pendant made of canning jars for $129. And I really liked these numbered jars from Pottery Barn. So here was my 1st floor chandy before. I know you hate it, but it was the very first chandelier I ever purchased and it’s sentimental to me. This is so easy that you’ll be wondering why you hadn’t thought of it before! So here is the “how to”: Buy a box of mason jars (if you don’t have enough sitting in your kitchen cabinet ). I bought mine at Walmart for around $7. I used the pint sized jars. 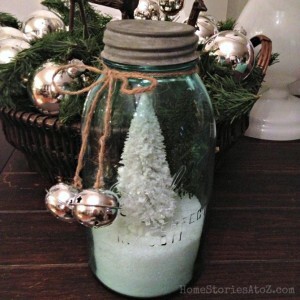 Simply remove the lids and pop out the tops so your jars are open and can fit on your candles. If you are a lucky owner of some type of vinyl machine, go ahead and rub those babies on. I am not said lucky individual, so I used more primitive methods. I printed out the numbers on cardstock using Engravers MT font sized at 350 and cut out all of the number. Then, I held the numbers in place on the jar and traced around them using a dry erase marker. Next, I filled in the numbers using black craft paint. I used a cloth to carefully wipe away the marker outline. Once you’re happy with your numbers, simply place them on your chandy and admire how cute it looks! I didn’t bother adhering the jars onto the chandy. If they are bumped, they don’t fall off easily so I think they’ll be safe. And here it is all lit up. I might go back and spray paint the lids to match my chandy, but for now I kind of like the two tones. You stated in your directions to just pop the top off. How are the jars secured on the fixture so they don’t slide around or fall off? I am at the point to place my jars but all the directions I have come across states to cut a hole in the top to help hold it. Hi Tina, I simply removed the inner canning lid and kept the outer lid intact and place the jar over the fixture. I’m sure all fixtures are going to differ in sizes. My jars don’t slide around at all and sit securely over each light. I had to use smaller lightbulbs so that they would fit. I love this look, I love mason jars or jelly jars, etc I have them as my candy, popcorn,etc, jars at this moment. I have been wanting to do a shabby chic chandilier for my dinning area. It’s so great. You should be so proud of yourself and thanks for sharing and being inspirational to us. Love your chandy. Your old one is still great for the right type of historical house. Thank-you for your Chandy post… Too cute! 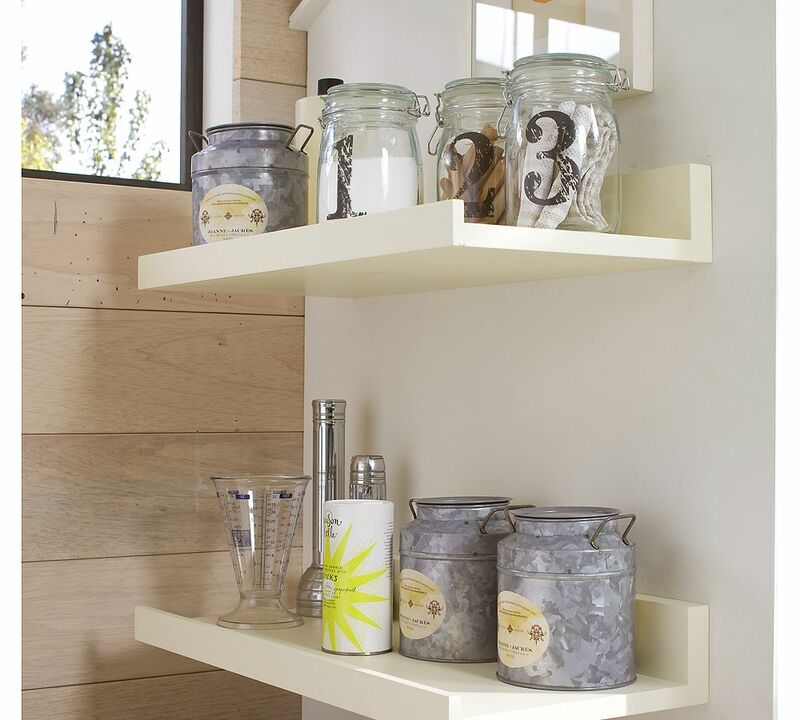 I will never look at a mason jar the same way…no more jams for those jars, no siree! Oh. muh. ga. These are so whimsically WON. DER. FUL! I love it… This project will have to get in line… I am gonna do it..
you are a genious…LOVE it. i have to do it. 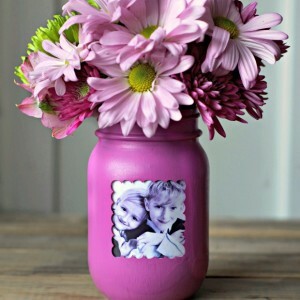 I came across this when looking at some ideas for my the mason jars in my kitchen and fell in love! I am currently hosting a knock off contest and would love to have you enter this (or another one of your knock-offs)! The contest entry period ends tomorrow. Come visit me!! I love your site!!! Just came across this….Great job!!! 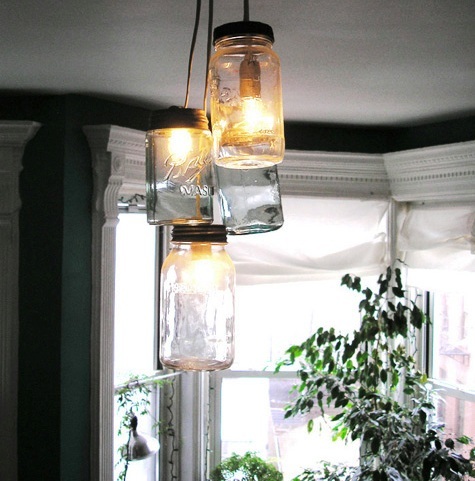 I have been coveting the milk bottle chandelier from PB…I will be using this idea for sure!!! LOVE the mason jar chandelier!! SO COOL!! I know you did this a while ago but I have to tell you I LOVE IT! LOVE it! I've been wondering what to do in my entry hall and this may be it. Of course, my *chandy* hangs down so I would have to affix those jars. I must try and find the rest of your lighting ideas because I have a horribly ugly light bar in my bathroom I hate, and an even worse track light in my kitchen that NEEDS to go! Beth, do you mind if I trackback to this on my blog? I just bought a chandelier at a yard sale today for .25 cents!! Woo-Hoo!! 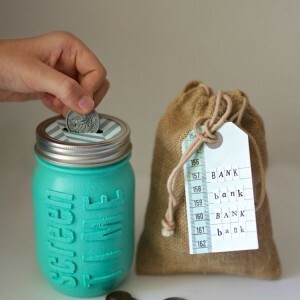 I am going to attempt to make my own, although the lights on mine are much to small to hold the jar, so I'm going to have to rig the jars somehow. BTW, I searched for this post on google and another blogger posted the same thing on the same day – pretty sure she stole the idea from you!! I love the vaguely industrial look the jars give to the chandelier – great job! I love this! I think I know what I need to make for my house next! Very clever and I love the fact that you did the numbers the old fashioned way – looks just as good as vinyl. This is definitely one of those projects that has you saying to yourself, now why didn't I think of that. Great project and tutorial! Really cute. I lke the way you combined everything into your chandy. I love it what a great idea, I will have to try this. Very clever – love it! Amazing! I love all the things I am seeing with mason jars recently. This is so beautiful! I think you are freaking amazing!!!!! So cool and what a deal money saver!!! Great Idea as usual! super super cute! love it! I *must* figure out a way to work the word chandy into casual conversation! And I love what you did! I wonder if it would work on my *chandy*. I am a little obsessed with mason jars, particularly the blue ones – a little weird? Maybe, but look what you can do with them! Just beautiful, Beth. sooo cute!!! great job Beth! I love the ones with the numbers on them. Very, very neat. Very creative and fun, Beth! This is amazing! I could totally see paying big bucks for this over that weird-looking cluster thing Pottery Barn is selling. I can't believe you did this so inexpensively! It looks brand new AND like you paid a good $500 for it. You might want to consider having the holes drilled as someone else suggested because you wouldn't want the jars to explode or a fire to break out. That is neat! I'd like to see how they look in the whole room. How fun! PS – I will be featuring this post twice tomorrow! First for the glass jar pennants and second for your chandelier!!! I love them!! I love them! I LOVE them!!! Gorgeous!!!!! And I scrolled down through the photos and missed your text before the one you made and I actually thought your photo was from a PB catalog! It's that good Beth! How creative! You have such great ideas. Beth! All your projects amaze me woman! You have such great ideas and they come out so beautifully! I want to decorate my whole house but I have to hit pause because the bf doesn't like the same things as I do. So I live through you! What a great way to incorporate a current trend that you love into your own home without spending a ton of money on it. I love the look of it, bit I do believe that is a fire hazard. I would take those jars and have holes drilled in the bottoms for venting out the heat at a glass shop. Beth!!! I love it!!! I've been wanting to do something fun with mason jars in my backyard. Now…… I am thinking it would be really cute to do my address on them and put them in the front yard! Thanks for the inspiration!! Wow, you are on a roll, aren't you. Yet another lamp makeover. I love your interpretation of the mason jar chandy. There is a popular milk bottle chandy in these parts, if I come across it I will take a picture for you. A very cute idea and I don't know how PB charges those illegal prices! You are so creative! I love the look of it. Can't believe it. I've never seen anything like that. So unique. That is just too awesome!! Love it Bad!! Wow, looks so great! And what an awesome job with the paint, I would have thought it was vinyl. Yes, the glass does get hot, so I wouldn't put any fabric over the jars. My chandy doesn't have a dimmer on it and I used 100wt bulbs which is a bit overkill. I can't vouch for whether or not this is a fire hazard so please make at your own risk! Dang. Even using a quart jar the light was too tall. I will have to just admire yours! That is totally adorable. Does the glass get hot? LOVE IT! What a cute idea! I'm looking into buying a chandy off of Craigslist right now for $15. I might just do the same thing to it! This is the coolest. You need to submit this idea to Apartment Therapy! Great idea! I've been obsessing about the pendant mason jar lights. WOW–that is SO amazing Beth!! I'm so excited to see how easy it is to make something so cool to put in the dining room. LOVE IT!! I'm so inspired! You amaze me!! I love it! oh my…how cool!!! i love those ideas! !